Garlic (Allium sativum L.) is in the onion family. For thousands of years it has been grown for culinary and medicinal uses. Garlic grows in a wide range of conditions; while most production is in mild areas, like California, some varieties grow well in cold climates, often with better flavor. There are two types of garlic, hardneck (or topset) and softneck. Hardneck garlic produces false flower stalks, called scapes. It typically has a half dozen cloves per bulb, plus or minus, while softneck types have twice that many. Softneck garlic dominates commodity production but in New England many growers prefer hardneck types for retail sale due to their flavor and appearance, which often includes a reddish purple clove covering versus the white color common to softneck types. 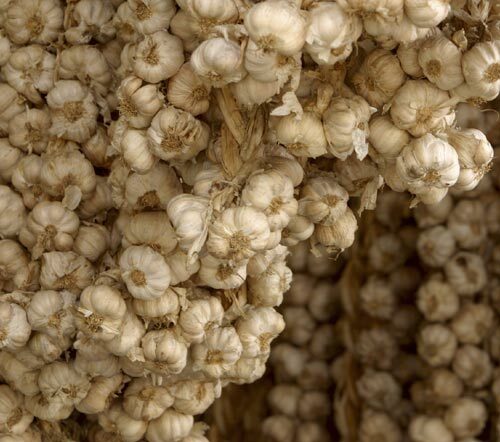 Softneck garlic generally has a longer storage life than hardneck and is easier to braid. After centuries of cultivation garlic has lost the ability to produce seeds so it is vegetatively propagated by saving bulbs from year to year and planting the cloves. The small bulbils produced on hardneck scapes can be used for propagation, but it takes several years of planting and selection to achieve marketable size bulbs. A well-drained soil with good tilth and plenty of organic matter is ideal for garlic. Excess moisture, compaction or droughty conditions will reduce yields. The optimum soil pH is between 6 and 7. Since garlic commences growth very early in the season it is important to avoid field that are slow to drain in the spring. Garlic is planted in the fall since it requires a cold treatment to induce bulbs formation. Planting typically occurs from October in northern New England to early November in southern areas. The goal is to allow good development of roots but not enough time for the shoots to emerge from soil before winter. Many different planting arrangements are used by growers depending on their irrigation, mulching and weed control systems; spacing too close can reduce bulb size while spacing too far apart reduces yield per area of land. Planting arrangements include: 2 row beds 30 inches apart on center with 6 inch spacing in and between rows; 3 or 4 rows per bed, with 6 to 8 inches between and within rows; single rows spaced 24 to 30 inches with 6 inch spacing in the row. Wide row spacing between rows allows for easy mechanical cultivation for weed control; multiple rows per bed allow for use of plastic much to control weeds. Garlic varieties differ in size and weight of cloves; generally, there are about 50 cloves per pound of cloves. Large cloves tend to produce the most vigorous plants and largest bulbs so small cloves are often not planted. Bulbs should be separated no more than a day or two before planting so they do not dry out. Cloves should always be planted with the root side down, about three inches deep. Only healthy-looking cloves should be planted to avoid disease and nematode problems. A layer of clean straw mulch is typically applied to garlic to avoid soil temperature fluctuations in the winter and early spring. The mulch also will help conserve soil moisture and suppress weeds. However, it may be advisable to remove mulch in a very wet spring to allow soil to dry out and thus reduce the threat of soil borne diseases. In very cold growing areas, removal of mulch can also speed soil warming and garlic growth in the spring. Because garlic is shallow rooted irrigation is very beneficial to maintain a consistent water supply, and yields will suffer if it is not applied during dry periods. Removal of scapes from hardneck garlic once they fully emerge may improve bulb yield, especially on soils of low fertility; the scapes are edible. Although variable depending on variety and growing conditions, one pound of garlic 'seed ' bulbs will usually yield between four and eight pounds at harvest. Depending on the varieties grown they may be ready to harvest over several weeks from late June to mid-July. When the lower third of leaves turn brown pull some bulbs, cut them across the cloves and look to see if the cloves have filled the skins and are ready to harvest. Pull, dig and/or undercut the bulbs to remove them. Unless a lot of soil is adhered to the bulbs they do not need to be washed at harvest although your markets may demand it. Place the harvested plants on wire racks or tie up in bundles and hang to cure for several weeks in a dry area with good ventilation. Then cut the tops off leaving an inch or so and trim the roots closely. If necessary bulbs may be brushed or the outer skin gently rubbed off to clean them. Seed garlic should be stored at 50 degrees with relative humidity of 65-70%. Cloves sprout most rapidly between 40 to 50 degrees. Garlic for table stock should be stored at 32 degrees and 65-70% relative humidity. Well cured bulbs in good condition should keep for 6 to 7 months. Relative humidity in storage is lower than for most vegetables because high humidity causes root growth and mold. For further information on production methods (including varieties, spacing, seeding, and fertility), weed, disease, and insect management, please visit the New England Vegetable Management Guide website.